Dear Gary, Could you please tell me why the flip-turn is not used in the breaststroke and butterfly? It seems strange to me, because the flip-turn seems more fluid and more fun to watch. Hi Wayne, What a great question. I agree with your suggestion and have no doubt that sometime over the next ten years the rules for breaststroke and butterfly turns will be modified so that flip turns can be used. This innovation would create more excitement on the turns and really challenge the swimmers. There would need to be very stringent rules especially for the breaststroke turn if a flip turn was implemented. Both turns currently include the technical requirement that two hands much touch the wall at the same time and then the swimmer must rotate their body from one direction to the other to perform the turn. The quicker they rotate their body and position their feet on the wall for a stronmg push off, the faster they will go. 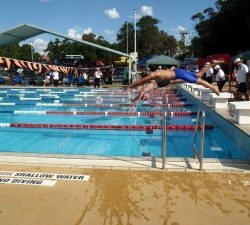 If a flip turn was introduced in breaststroke, the rule would need to be adjusted so that on the final stroke of breaststroke on each lap, the hands may be brought down past the hips at the beginning of the flip turn. I would imagine one fly kick may also be allowed. The implementation of a flip turn in butterfly would be easier as the swimmer is already doing fly kick and could tumble over at the completion of the arm pull. Swimmers would need to be very fit and have a strong lung capacity to perform a breastsroke or butterfly flip turn. Currently swimmers take a breath as their hands touch the wall in preparation for the split stroke in breaststroke or up to 15 metres underwater kick in butterfly. The deletion of this breath will really challenge most swimmers as their last breathe before the turn will be a second or two earlier. How to fix arm going across body in Freestyle? Butterfly kick vary with pool size? Hi Katherine, Junior swimmers should start with 4 to 6 butterfly kicks underwater every time they dive start or push off the wall. They should gradually increase it to 8, 10 or even 12 kicks as they get stronger. 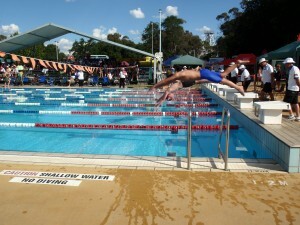 The number of kicks will be the same whether they are racing in a 50m, 25m or 25 yard length pool. Actually, you can do a legal turn in both the Fly and the Breaststroke. The rule language on both strokes states that once the legal touch with both hands has been made, the swimmer can turn in “any manner.” This would include a flip turn. You just need to ensure that you leave the wall past vertical towards the breast. There’s actually a nice video on You Tube of a swimmer performing just such a turn for the breasts stroke. For the fly, it would be more a downward swipe with both hands the swipe the wall and lead you to a turn. Just need to make sure you leave the wall on your stomach. Agreed. There are a few kids in our club (including my 13 year olds) who are experimenting with the breaststroke flip turn. Under the current rules, the trick is brush-touching at the wall…and of course the breath issue. The verdict is still out for them on how much advantage it may or may not be, but they all think it should be faster if done really well. My daughter’s old swim coach had them do breaststroke and Fly tumble turns all year insisting they were faster. They were not, at all. It slows down all of the younger swimmers who do not have the lung capacity to lose that breath right before the turn. It slows down the older swimmers because their legs are awkwardly up against the wall because they have to touch the wall with both hands before turning, not leaving them much room, and having to awkwardly switch to their front before leaving the wall. Overall it was awkward, and even after doing it all year, it didn’t improve anyone’s times. After the coach left, everyone went back to the proper turns, and everyone’s times improved significantly from the flip turn year. (I should also point out that at the first swim meet, the stroke and turn officials wanted to DQ everyone because they hadn’t seen the turns before, and many kids did get disqualified for that reason, because it is difficult to see their hands touch while turning because they are far under the water).